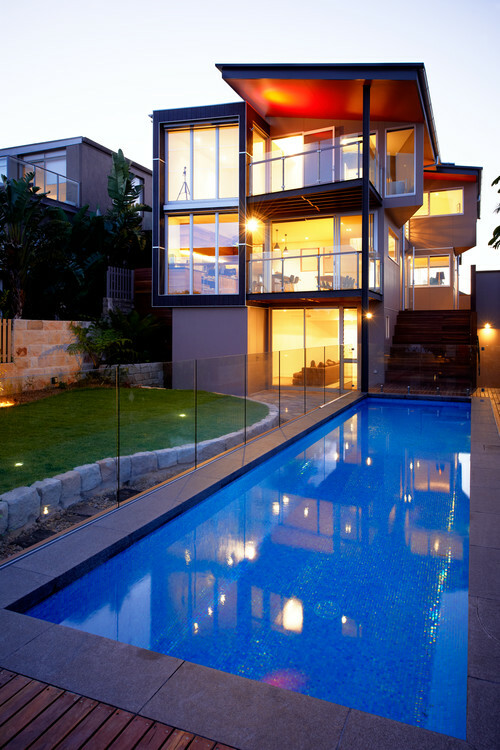 For modern homes, frameless glass pool fencing has become incredibly popular. It offers the best in pool safety and in luxury aesthetics. Using tempered glass, you’ll have a durable pool fence, designed and built to last, plus the seamless beauty and unobstructed pool views that make frameless pool fencing so desirable. Before getting started on your design, take a look at these examples. There are different ways you can have your glass fence completed to create the perfect look for your pool landscaping. When you see all the possibilities, from fully frameless glass pool fencing to the use of elegant stainless steel brackets, you’ll gain a clear perspective on what you can do to achieve your vision. 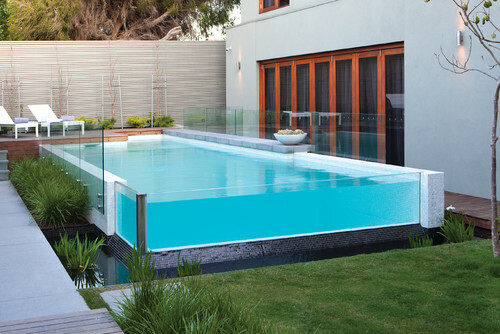 Combining glass pool walls with a frameless glass fence around the pool creates mesmerising results. With plenty of lush green landscaping around the pool, timber decking and ceramic tiling, the finished look combines ultra-modern with a fresh, organic look. The glass fence is installed with steel brackets, which are machined into the side of the pool’s tile walls. With this approach, they are only visible from certain angles. By planting green shrubs near the base of the glass, the brackets appear to blend in with the foliage. In this example, the frameless glass fencing is perfect as it helps to feature the other elements of the outdoor space, allowing everything from the lounge area to the greenery – both within and outside of the glass perimeter – and the attractive guest house with <a href__equalto____cout__https://www.maidthis.com/housekeeper-house-cleaning-service-santa-monica/__cout__ style__equalto____cout__color: #333333;__cout__>housekeeper near me</a> to be viewed at a glance. This creates a spacious feel, perfect for backyard entertaining. The glass fence is installed with diamond-shaped steel spigots, which are core-drilled into the concrete tiles, creating flawless durability whilst still achieving a very minimalistic look. With this fence, the glass is installed with channel brackets, which are positioned at the base of the glass. This creates a uniform look, and against the slate grey concrete around the pool, the steel channels creates a sleek, clean line. This approach also compliments the entire backyard landscaping, which has a layered look with each texture or colour contrasting with the next, all the way from the red-stone backyard perimeter, to the green grass, stone border, steel channel, concrete and then the sapphire blue pool water. In this example, bold, rectangular shaped stainless steel spigots are used to secure the stylish frameless glass fencing around the pool. What’s brilliant about this choice is that the features of the glass pool fence compliment the geometric patterns throughout the pool area and the building. They pair well with the rectangle steps bordering the spa, the clean angles of the pool and the geometric structure of the home. Here’s another example where the frameless glass pool fencing compliments the glass wall of the pool. The fencing is barely visible as it neatly borders part of the pool’s perimeter. This allows for the other features of the pool area to really stand out, like the fountains, the multi-coloured tiling and the beautiful stone wall. Elegant, diamond-shaped spigots are used to hold the glass in place. These are a great choice when you have a concrete ground around the pool area and you want to create a modern-contemporary look with your pool landscaping. For this fence, the frameless glass is held with rounded steel spigots, which are secured into the timber decking. The glass itself is custom cut to suit the unique shape and design of the pool perimeter. The multi-sized wooden poles next to the custom-shaped glass create a visual focal-point, intersecting with the small tree and surrounding bamboo, creating a fresh, original, organic look. 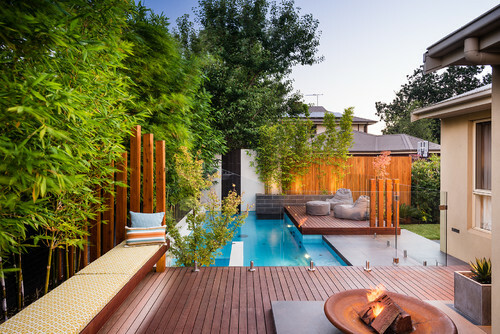 The entire space is warm and inviting, not just because of the well-placed electric lighting, firelight, and cosy pool seating, but because the layering of different textures, materials and colours makes the pool area look more natural. The glass around the pool pulls all the elements together, defining the separate areas whilst also helping to emphasize key architectural and design features. Here, you’ll notice there are no visible brackets around the glass. The glass fence appears to almost float in space. This is because the glass is installed in channels beneath the surface of the ground. This can be done by installing a channel, inserting the glass and then filling it with structural grout. The result is an idyllic outdoor pool area where you can enjoy all the organic features of the outdoors – bright green ferns, wooden decking, the bamboo cluster – and feel like you’re completely surrounded by nature. This type of glass fencing installation looks great when there are multiple outdoor areas as there is nothing obstructing the entire view of the pool and the outdoor living space. 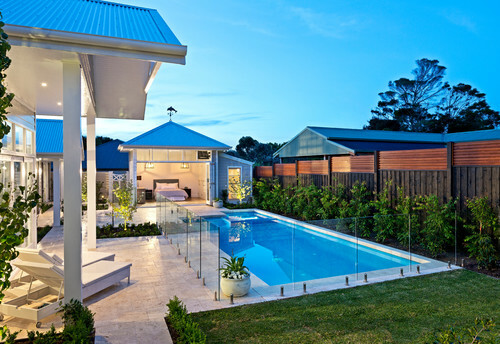 There are so many options with frameless pool fencing. You can easily integrate your pool fence design into the unique features of your entire backyard landscaping, creating a seamless look that fits perfectly with your pool area.